No set profile for the HVL-F32M? My system works alright without it but I was wondering why there's no built in profile for the HVL-F32M that a large portion of us with Sony flash systems have. Before the Cactus V6 iis, a common thing would be a HVL-F32M on the camera hotshoe to set off other stronger flashes like the F43M and F60M, since this was the smallest flash to support HSS. I'm glad to now use the F32M as my background flash but would have had a happier time if there was a dedicated profile for it from the get-go. But did you know you could create your own dedicated profile? We now have the Profile Editor, where you can set the GN of your flash and saved a custom profile on your V6 IIs. Here's a preview of the Profile Editor. Haha! I was thinking that might be the reason. However, those of us who have been shooting Sony for a while using the flash based triggers would most likely have the F32M. 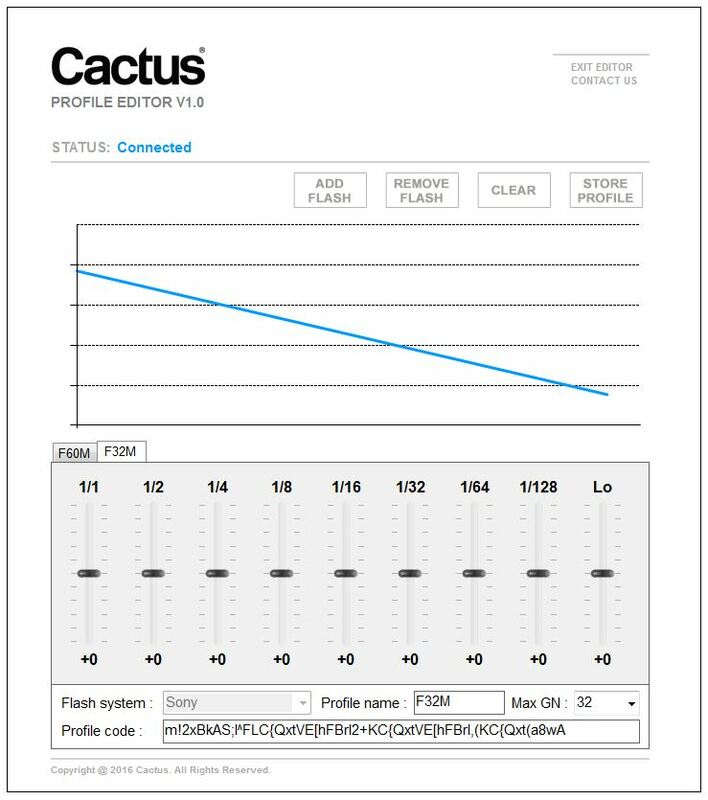 If Cactus included the profile, it would save a large portion of Sony users some time, and likely add to their overall happiness with the V6iis system. ...those of us who have been shooting Sony for a while using the flash based triggers would most likely have the F32M. If Cactus included the profile, it would save a large portion of Sony users some time, and likely add to their overall happiness with the V6iis system. Sure! But I wonder how much a difference is there in terms of power outputs between an AUTO Sony profile vs a specific Sony profile. I'd be interested to find out too. Maybe I should do some AB test with the F60M or one of the Metz units. Hmm, that's a good question. I think it really came down to me really wanting recognition for my poor F32M. F32M is a nice little flash. Though I have used it but I almost bought it for travels. Ended up bringing the rather bulky RF60. It's true, I use the RF60 all the time, but the F32M is smaller and it seems a little more durable. Sure, but recently I have been playing with Sigma's EF630 and that one looks and feels really durable. Good old Made in Japan too!